Mohamed Moctar is packing his belongings. There is not much is his room besides a sleeping mat, a blanket, a small sound system, a teapot, two cups, and a heap of cloths. All of it is on the floor. “I will return to Timbouktou now it is liberated”, says Moctar a teacher at a primary school in the legendary city in the north of Mali. Within months the rebels had introduced the strictest form of Sharia, the Islamic law. “We were commanded to public places to witness the cutting of hands of thieves and whipping and beatings for other offences. It was sheer terror.” It all became too much for Moctar, a Touareg, and he left for the capital of Bamako in the south of Mali. He was not received with open arms. Mali has some twenty different tribes and most of them have issues with the Touareg. It was the MNLA, a secular Touareg militia that had started a year ago an uprising against the army. Aim was the creation of Azawad, an independent state in the north of Mali. Touareg, originally a nomadic people, live in the Sahara spread over Niger, Mali, Algeria and Libya. The trading caravans ploughed centuries through the desert sand. But truck took over the role of the camels and repeated droughts decimated the herds. 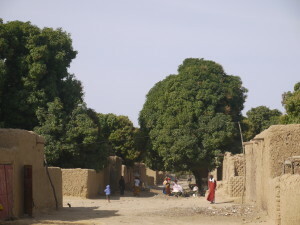 In Mali the nomads settled in villages and cities in the north, less developed than the south. The proud and brave Touareg did not take their lousy situation lying low, and in the sixties and nineties they started rebellions in Mali. They got support from the former Libyan leader Moamar Khadaffi. The revolts did not change much and large groups of young Touareg were facing a hopeless future. They packed their bags and offered themselves as mercenaries to the Libyan leader Khadaffi. When he was deposed, the well trained Touareg mercenaries helped themselves to big quantities of arms from the Libyan armory and returned home. They offered their services to the MNLA after which the militia had an easy task to chase away the Malian army from the north. But within three months they themselves got unseated by three radical Islamic groups. Moctar and Mohamud don’t show themselves a lot on the street in Bamako. Their light skin color makes them stick out in the crowds and both have noticed the aversion of the average Malian towards them. “It’s better to go home and help get our city back on its feet after the experience”, says Mohamud. He shrugs his shoulders over the report of revenge against Touareg in the north. “People know me. They know I was neither pro Azawad, nor am I a radical Muslim. I bet on the wisdom of the inhabitants of Timbouktou”. It did not help the Touareg case that the leader of the Ansar Dine, one of the three extremist groups which had occupied Timbouktou, is a Touareg. Iyad Ag Ghali was like most Malians a tolerant Muslim who combined his religion with century old traditions of his people. But a stay in Saudi Arabia brought him in close contact with jihadists who use war to impose the pure and strict form of Islam. He was in Saudi Arabia as a diplomatic representative for Mali, appointed the last year by the deposed president Amadou Toumani Toure. The good relationship between the ex president and Ag Ghali was incomprehensible to many. Ag Ghali smuggled amongst other things drugs and people through the Sahara. He was a mediator between governments and Al Qaida in the Magreb (AQIM), another group of mainly Algerian extremists who also occupied part of northern Mali, and have kidnapped a substantial number of foreigners. “The mediation made Ag Ghali richer just as well as AQIM. With those funds they could become better armed and attract more militia fighters”, concludes political analyst Mamadou Fadiala Ba. President Toure always strived to keep everyone on his side. He used government positions, money and looking the other way when corruption or other criminal acts were involved, to bind people to him. “He bargained with everyone. For fear of a military coup he weakened the army. That was the reason why the forces were trashed by the rebels last year”, says Ba. He does not hold the Touareg responsible for the present situation. According to him the first mistake was made by the political elite in Bamako which did not enough for the development of the north, had the wrong friends and was not strong enough. Toure was deposed in March last year by angry military who were furious about the bad state in which the army was, and frustrated over the defeats in the north. Who really has the power at the moment is not completely clear. President Dioncounda Traore is a civilian president who leads a transitional government and was the one who asked the French to intervene militarily in the north. He did that most likely without informing first the leader of the military junta, Amadou Haya Sanogo. Both men for the time being seem to be holding each other in a shaky power balance. There are voices that call for a national dialogue followed by elections which are for now planned mid this year. But are elections the solution for Mali’s misery? Toure was democratically elected in not fully transparent elections, “I think that the development of the north is, of the highest priority. If that will be achieved, the dissatisfaction with revolts in its wake, will disappear”, believes Soumeylou Boubeye Maiga, former minister of defense, foreign affairs, and head of the internal security. He had lost his job through the military coup and has not been recalled by the present government. Mali, already a poor country, is doing economically very bad since last year. For some time it was one of the fastest growing economies in the world. Bamako doubled in size. Now uncompleted buildings are standing everywhere in the city. Money to finish them is not there. One of the main sources of income, tourism to fabled cities like Timbouktou, Djenne and te Mopti Plateau is dead. Developing organizations withdrew after the military coup. Poverty is visible in the cities as well as in the countryside. He is also the owner of a construction company. In his office in Bamako, where red carpet not only covers the floor but also adorns the walls, he is preparing for his return to Timbouktou. He has not been there for a year. He also need to assess the damage to the new building his company was constructing for the century old manuscripts for which Timbouktou is famous. Although some manuscripts were burned by extremists, most survived because they were hidden by the public. Haidara is proud of his city and its citizens. He explains that since 1410, Timbouktou annually celebrates the birthday of the prophet Mohamed with a huge party. “This year the extremists forbade the party. That was the first time in our long history. I promise you next year we will, like always, celebrate the day that our prophet was born”.